Dwayne Peaslee was no ordinary person. He was a leader in uniting the business community and union members to support job creation. He helped people see how important the skilled trades are to our quality of life and was at the table on almost every important issue related to job creation until his passing in 2013. He wanted what the Peaslee Center now wants—great careers for our citizens who want to work in Lawrence and Douglas County. Dwayne became Lawrence’s Citizen of the Year in 2012 after a lifetime of hard work and advocacy. He was born in Lawrence and always lived in the area except for his time in the United States Army as a medic in the 1950s. 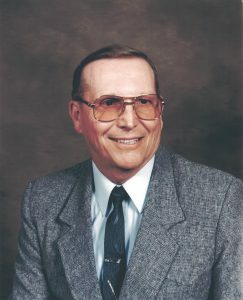 Dwayne served as a pipefitter for 60 years and became the business manager for the Kansas Plumbers and Pipefitters, in Lawrence, from 1987 to 1993. In August 2011, Dwayne was inducted into the United States Apprenticeship Association Hall of Fame. That induction served as a testimony to his lifelong commitment to education and apprenticeship programs. For his entire career, Dwayne has been a strong advocate for careers in the trades. His induction into the USAA Hall of Fame was the 44th induction, but he was the first person from Kansas to be so recognized for his work. Dwayne always said that he felt a strong connection to working with labor and business for the good of the community. His first connection to the Lawrence Chamber of Commerce was when he became the Business Agent for Local #441, in Lawrence, in 1987. When he was organizing the office, Dwayne found a Certificate of Investment, which was purchased by the union to support starting the Lawrence Chamber of Commerce. Knowing his local needed money, he went to the Chamber office and asked to redeem the certificate for face value of $100. The Chamber paid him for the certificate and the relationship began. Dwayne repaid that exchange by engaging in economic development fundraising. Not only did Dwayne’s union pledge funds, but also he raised money from other community locals in support of job growth in Lawrence and Douglas County. That story is part of the beginning of Dwayne’s work on behalf of the community. He worked in partnership with his union members and the business community, always thinking of what was best for the entire community. Over many years, Dwayne served on a variety of Boards and Commissions. He served seven years on the United Way Board and coordinated the refurbishing of the current facility so that small agencies could pool resources to serve the community needs. The Center won a national award. Then Mayor Jack Rose appointed him to the Lawrence-Douglas County Planning Commission. Also, he was appointed to the Lawrence-Douglas County Economic Development Board and served from 1993 to 2004. He often spoke before the City and County Commission meetings in support of economic development and addressed his personal support for the need for companies to come to Lawrence. He believed that the Lawrence’s businesses provided good employment for his union members and sought to ensure that the citizens of Lawrence would always have good job opportunities. A great source of pride for the Chamber and for Dwayne was his service on the Lawrence Chamber of Commerce Board of Directors. He remains the only Business Manager of a local union to have held a seat on the Chamber Board. He was proud of having served on the Board, and believed together they made good things happen for Lawrence and Douglas County. Dwayne became even more actively involved in 1988 when he began to meet with and help the City Commission, County Commission, School Board and state representative candidates run for office. He worked with those candidates who were pro-job growth, supportive of needed infrastructure improvements, such as the South Lawrence Trafficway, and vocational training. He garnered financial contributions from area union locals as well as volunteers to put out signs. He also established forums for all candidates to meet with local union members of the trades, police and fire. Over the years, Dwayne helped to gather trade union members to help with serious social needs for the Winterizing Homes and the Heats On programs, both designed to help those most vulnerable get what they needed to make their homes safe and warm. In retirement, he continued to serve on local and state boards and advocated for the Lawrence Chamber’s focus on economic development and job training. He was well known and respected by the management of the plants in which he worked, the people he represented in his union, and by the broader business community and local governments. Dwayne often spoke of his strong belief that, what is good for the union members and what is good for the business community, is good for all. He knew that you must use your skills and experience to help others, and never hesitated to be the first to say “yes!” when help was requested. We are proud to bear his name and pledge to continue offering excellent support for skills training and business growth.